Beautify your rooms in one easy step by installing new luxury vinyl floors. 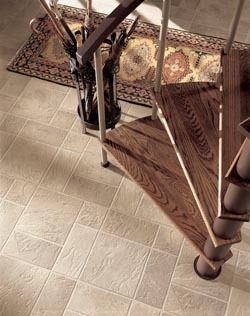 Our store stocks a wide array of luxury vinyl flooring in Beaumont, TX, allowing you to achieve any design goal. Whether you want a bold, contemporary design or a surface that looks just like hardwood, you will find what you are looking for at our showroom. Not sure what you are looking for? Our team is happy to help. Talk to one of our design specialists about your design plans, your lifestyle needs, and your stylistic preferences. Based on the information you provide, our staff members can help you choose the ideal surface for your remodeling project. There are many reasons why you should choose a luxury vinyl tile or plank surface. Perhaps the biggest reason why homeowners love luxury vinyl is that it combines beauty and resilience into one affordable surface. Hardwood and tile are popular flooring options, but not everyone has room in their budget for a wood or stone floor. However, luxury vinyl is on the cutting edge of innovation in the interior design industry. It can authentically imitate the appearance of any flooring material at a fraction of the cost-- including hardwood and tile. Property owners also decide to install luxury tile and luxury plank flooring because it is resilient, long-lasting, and easy to clean. Keeping a luxury vinyl floor clean simply requires routine sweeping and the occasional mopping. Furthermore, spills are no issue. As long as they are wiped up quickly, they will not stain. Talk to our experts to learn more about how easy it is to keep your vinyl flooring looking brand new years after installation. Finally, luxury vinyl can also endure conditions that other flooring materials cannot. It is resistant to water damage, so it works well in wet areas like the kitchen or bathroom. Since the material is soft and specially designed, it can also withstand fluctuation in temperate without contracting. Learn more about the advantages of this resilient flooring by contacting us. Getting the right fit is important for flooring installation projects. We make it easy by offering professional luxury vinyl flooring installation through our store. There is no need to search for a contractor you can trust and struggle to do the installation on your own-- we’ve got you covered. Find out more about our installers and the services they provide by reaching out to our showroom today. Contact us if you have questions about the luxury vinyl flooring styles we carry. We proudly serve customers throughout Beaumont, Orange, Port Arthur, Nederland, and Port Neches, Texas, plus the surrounding areas.